This was my 3rd duathlon of the season. All 3 were exactly the same course, so the idea was that I’d improve my times from Race 1 to Race 3. Of course, that was before Race 2 happened! Race 2 was done on, as it turned out, not one but two flat tyres. So it could only get better from there! The weather conditions were significantly better than last time – it was still a bit windy but it was a lot warmer. It was clearly the bike leg that needed improvement. All I needed to do was have both tyres adequately pumped up, and use my gears properly. Simples! The day before the race, I got a parcel from Mekong which included my brand new tri-suit! There was nothing wrong with my old one, but the Mekong one was just so pretty, plus I had been assured by several people that it would make me go faster, so naturally I had to have one! And this duathlon would be the perfect opportunity to try it out! It fit perfectly and was uber-comfy! On arrival at Victoria Park, I racked my bike and coach Kent (the one who pointed out my flat tyre last time!) came over and checked my tyres – they both got the thumbs up! There were a few familiar faces out there, notably ultra running mother/daughter team Heather and Ally, both doing their first duathlon. Kristie was back again, and Karen and Daryl were there as spectators this time (Karen having had a bike mishap during the week). It was quite warm out there, for the first time in any of the duathlons I did take advantage of the cups of water near the start/finish line on most of my running laps! On the first run I started reasonably conservatively on the first of 4 laps but then my competitive side kicked in and I decided to try to pass as many people as I could on the run. I would probably pay for it later but it was my chance to get a bit of a head start on the bike leg! According to Strava I finished the first run in 17:59 and got through the first transition in 13 seconds – I’m not sure about that T1 time but I’ll take it! It took me a few hundred metres for either of my feet to click into the pedals, which was a bit frustrating, but eventually I did get them in! Riding past the grandstand (with wind assistance) I went into a higher gear (as per Shane’s advice from the first duathlon) which really helped to stop my legs from going too fast! The trickiest part of the course as always was the ‘hot dog’ hairpin turn (so named because on the map it kind of looks like a hot dog – they probably could have called it something else but it is a family-friendly event!) It took a few laps before I got it sorted – and as per previous races, as the laps ticked by, there were less and less people left out there to potentially be trying to pass me! I did get passed on my left a couple of times but mostly people were really good and called out as they were about to pass me on my right. All in all, the ride went pretty smoothly. My Strava time for the ride was 37:46, compared with 44:08 in Race 1 and 47:43 in Race 2. It was all because of the suit! Then I went through T2 just behind Kristie (T2 was 39 seconds according to Strava) and headed back out for 2 more laps of the run course. Kristie didn’t use bike shoes so her T2 was a lot quicker than mine, giving me something to chase in the run! Gosh, 2km feels like a long way! On the second lap I decided to try to pass as many people as I could. Although my legs felt pretty heavy, I guessed everyone else would be in the same boat! When I got to the last few hundred metres there were a couple of girls I decided I needed to at least try to pass. I actually ended up passing one RIGHT on the finish line, that was a good feeling – for me at least! My overall time was 11 minutes faster than Race 2 and around 6 minutes faster than Race 1. So it was an overall PB as well as a bike PB – a great way to end the series! Thanks to Triathlon SA and all the volunteers for putting on the series, I have learned a lot from the 3 races and I know I still have a lot to learn! 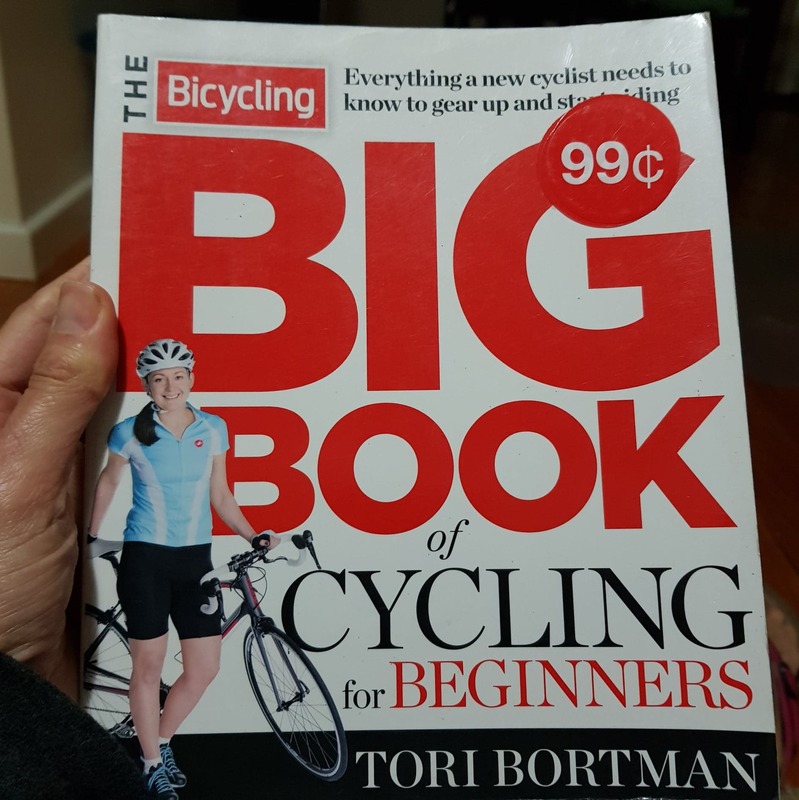 One of the things I love about the triathlon scene is that people are really friendly and encouraging, and always willing to offer a tip or two to help a newbie like me! I’m still deciding whether to go to the final race in the Barossa Valley (there’s a hill in the bike ride, but there is wine in the Barossa…). Decisions, decisions! I didn’t want to write about this one, because it sucked. But then, you do have those days, and it would be unfair not to write about the sucky races, because they happen! The first race in the series went reasonably well after Shane gave me the tip about my gears. I had decided to try to do the whole series, if only to try to improve on my own times. Race 2 happened to fall the day after a very entertaining work function, so consequently I left it until the day to enter, just in case! It was a windy day but thankfully not raining, so I decided to give it a crack. The first (4km) run was just OK – a bit slower than last time, but as I was managing to overtake quite a few people, it still felt OK. Transition 1 went as well as can be expected. 22 seconds to change shoes and hat, grab the bike and head off onto the cycle course. 8 x 2km laps. Sounds pretty easy, right? Well let me tell you it wasn’t. The bits where I was riding with the wind were just OK. The bits where I was riding into it were not. On a few laps I was almost blown sideways off the track! That wasn’t helped by the fact that on the first few laps people were passing me on my left – luckily there were no collisions, there could easily have been! EVERYONE passed me. Almost everyone. The wind was a factor, sure, but everyone else had to contend with that too! Not many people passed me on the last few laps. That was because almost everyone else had finished by then! I knew to use the harder gears on the faster parts of the course but on this occasion the gears were just not working for me – the bike was not sounding normal, and I knew there was something not quite right but I wasn’t about to stop, I just wanted to Get. It. Done. After what seemed like an eternity I made it back to transition. T2 sucked as well. The spot where I had had my bike, now had someone else’s bike in it, so instead of there being a nice gap for me to put my bike, it took me a while to actually find my ‘spot’! I had to wrangle the bike onto the rack and try not to get tangled up with other bikes, which wasted a bit of time. Then because of how the bikes were racked I had to get on my hands and knees to retrieve my running shoes and hat. In the process of taking my long sleeved top off I dropped my sunnies and one of the lenses fell out. Oh well, luckily it wasn’t sunny, I could manage to run 2km without them! After what seemed like an eternity (59 seconds according to Strava) I was finally out on the last run leg to finish the race. My second run wasn’t too bad although my legs were completely like jelly to start with, more so than last time! When I look at my time for the second run leg I averaged 4:34 pace which is not too terrible. It certainly felt slower than that. I am sure I would have been able to overtake some people if there’d been anyone left out on course. So that was it – Race 2 done and dusted. Not my finest moment by any means but a good learning experience! Everyone else did well. Karen and Daryl placed again, as did Ros, who had done the short course. Cherie had successfully completed her first duathlon. Karen and Daryl showing off their bling. Me, the unwitting photobomber in the background! So there you have it. Shortest race report ever! Thanks to all the organisers, volunteers and other athletes out there, and I guess I’ll be seeing you again at Race 3! Oh and as a post script I was out today, got caught in the rain so stopped to look at a bookshop while I waited for the rain to clear. Found this. Think the universe is trying to tell me something! Boxing Day 2017 saw the 30th and final running of the Sam White Memorial Aquathlon – see this link for a bio of Sam White and the history of this event. Swimming and running, my friends. Swimming and running. Kind of like a triathlon without the cycle leg. The format of this particular event was simple. First up were the Enduro aquathlons, consisting of 1, 2 or 3 reps of the following – 250m ocean swim and 1.7km run. After this was the Elite event, 1.7km run/500m swim/1.7km run/500m swim/1.7km run. I wasn’t able to stick around to see this event on this occasion but I do remember watching it 2 years ago. From the dead calm waters I’d swum in earlier that morning, the wind had picked up considerably by the time the Elites got out there! It was great to watch! I entered the Medium course – 2 swims and 2 runs. In 2015 I went for the Small course, but given that this was the last event, I wanted to take it up a notch this time around! It would be my first time running and then going back into the drink! 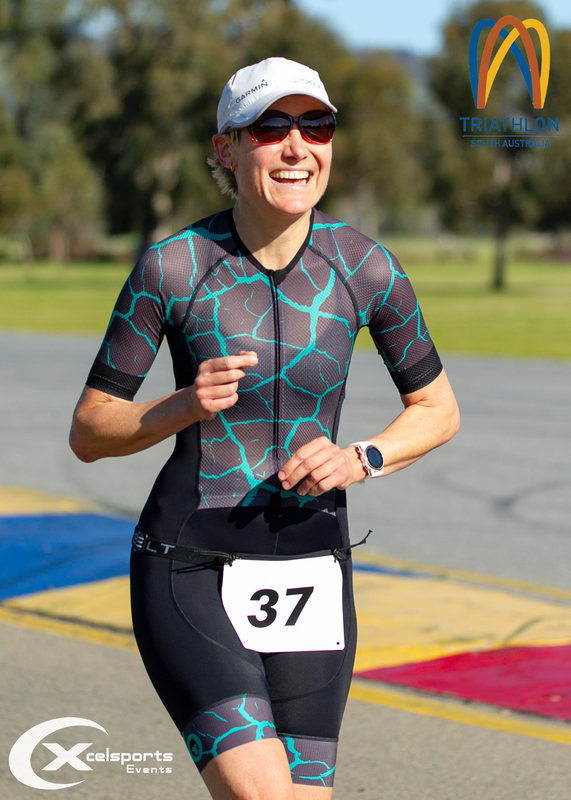 I had to figure out how to attach my race number – it was waterproof but I couldn’t imagine it would be that easy to swim with a race bib pinned to your front! Then I remembered my race belt in the car (probably about 1km away) – perfect! I could attach my number to my belt, put it in the transition area and just put it on when I went into the run leg. Luckily I had arrived very early which gave me plenty of time to go back to the car. I was early because I had decided I also needed to do a ‘normal’ Tuesday morning run, I had gone out to run with the Semaphore running group at 7am, just a little way up the coast from where the aquathlon was held at Glenelg at 11am. Originally I’d planned on 10km because “I don’t get out of bed for less than 10km” (unless it’s a parkrun, a race or a hilly trail run) but quickly revised that to 8km. As well as my race number I also had to get my age group written on the back of both of my legs, and pick up my swim cap. This time around I got a green cap – I really wanted a pink one but that would have meant I had to do the Large course. OK, I didn’t want a pink cap THAT badly! And then I had to attach my timing band, taking extra special care to follow the instructions, because a lost timing band would cost me $55! I’d used bands like this before but never in a swimming event, so the possibility of losing one had never really been an issue! Pre-race pic with Karen – timing bands firmly attached! There were plenty of spectators – it was a beautiful morning! The crowd were gathered on the jetty. To the left of the pic, part of the transition area. The fancy Garmin ready to go! According to my watch, swimming is classified as “Other”! Sorry – bit graphic! Hope no-one’s eating! The swim was much the same as the one I’d done in the triathlon last month. Out, across and back. Like 3/4 of a square. The water wasn’t too choppy but there were some waves. I don’t have much experience in ocean swimming (although since this event I have had a very productive ocean swimming lesson where I learned about swimming under waves!) so I wasn’t expecting any great things from the swim. Like the triathlon, it was all about ‘just getting it done’. That’s me under the arrow! Note the bunch of swimmers WAAAAY out in front of me! Thanks Daryl for this pic! The ‘out’ part of the swim was the hardest, swimming against the waves. Then it was straight across, which wasn’t too bad, and then swimming back to shore WITH the waves. One thing I did know about open water swimming was that you keep swimming until your hands touch the sand. No sense running through water, wearing out your legs, when you could be swimming and predominantly using your arms! Then it was into transition, where I had my race belt, cap, sunnies, running shoes (with elastic laces) and socks. I decided for the first run not to wear the socks, and then depending on how that went, I might decide to wear them for the second run. While giving my feet a quick dry off, I managed to get my goggles full of sand, but I figured I could always wash them off in the ocean as I ran in for the next swim! I grabbed my shoes, ran up off the beach, dusted off the sand and slipped into the shoes. Some people had buckets of water ready to wash their feet but I didn’t bother with that and didn’t have any issues. Maybe for a longer run I would do that but not for 1.7km. The run was good. I had no worries about the run. I always expected to pass people on the run, which I did. Running past the Grand Hotel! Thanks Daryl for this pic! The second swim was harder and subsequently slower – mostly because my legs were a bit cooked from the run, and of course the start of the swim involves more running, but this time through water and against the waves! At times I did do breaststroke kick with freestyle arms (mostly when I encountered waves and when going around corners). And I did get smacked in the head for the first time ever, on the approach to shore! The guy didn’t even seem to notice that he’d smacked me! This time, I went through transition, grabbed my sunnies and shoes and was away! Didn’t even bother trying to dry off my feet this time. And opted to go sans socks again. I also opted to go sans race number, which the marshal at the jetty pointed out, so I had to go back and grab that, at which point I also grabbed my cap which I had also forgotten. Probably cost me about 20 seconds if that. In the overall scheme of things, it wasn’t a big issue and definitely a mistake I won’t make twice! Back into the run! Kind of looks like the guy is grabbing my arm – he wasn’t really! Note the buckets of water the proper athletes were using to wash their feet! Thanks Daryl and/or Karen for this photo! A slightly slower second run, still overtaking people along the way, and then back on the sand, this time to go through the finishing arch! I could hear someone behind me, I could tell it was a guy, so not someone I could potentially be competing with, but still, I didn’t want to be passed at the finish line – by anyone! Time is probably inconsequential, but I finished 4th female (out of 9) and 11th out of 22 overall, in a time of 31:12, ‘only’ about 5 minutes behind the 3rd placed female! (The top 3 females were all in the under 16 age group!) That’s why I said my transition error didn’t really cost me anything! The splits were interesting but not really surprising. Overall I was pretty happy with how it went, it’s all a great learning experience! Karen won her age group too! Thanks to all of the many volunteers who made this event possible, to organiser Malcolm (whose timing company Event Strategies is very well known among trail and road running events in SA!) and to the White family! And well done to all who participated – what a great way to start Boxing Day! It’s something that has been on the cards for a while. I’m not sure exactly when I decided I wanted to do a triathlon, but it was late 2015 when Nat first gave me lessons in riding a road bike and using cleats, and when I first started going swimming semi-regularly (I had been a swimmer in the past, not a particularly fast one but a competent one, but I just found it incredibly boring so I gave it up and didn’t start again for many years! That year, 2015, I competed in my first multisport event, the Sam White Memorial Aquathlons, at Glenelg just after Christmas. As a first timer, I opted for the short course (250m ocean swim and 1.7km run). There was also a medium and a long course (2 times and 3 times the short course). I managed to win my age group and also 10 passes to the local swimming centre which made it a pretty worthwhile exercise! Now I had a bike, I had decided that this summer I was going to bite the bullet and get that first tri done. The Gatti series was a perfect choice – not far from home, and catering to a wide range of abilities. There were several distance options ranging from the Mini (100m swim/6.5km bike/1k run) to the Challenge (800m swim/26k bike/6k run). For my first one, I decided on the Tinman (300m swim/19.5k bike/3k run). The Mini was a little bit too short – I suspected my transitions would take longer than the actual swim/bike/run bits! And the Challenge was a bit too long – especially 800m in open water. I was pretty confident I could swim that far but I’d never swum more than about 400 in open water. Because I wanted to look like a triathlete, at least until I got into the water and started to swim, I bought myself a tri suit online. I went with a 2XU one, I got it cheap and I knew the 2XU sizing from other stuff I have. It took a bit longer to arrive than I’d hoped, not arriving until the Monday before the race. I wanted to swim, ride and run in in before the day. On Monday, which was quite a hot one, I went out to my usual cycling haunt, Victoria Park. Unfortunately my usual track was blocked off with a equestrian event being set up, so I had to ride a shorter loop (and consequently a lot more laps!). I’d opted to put a T-shirt on over my tri suit – the tri suit is sleeveless and I didn’t want to have to put sunscreen on my shoulders. I would of course do that on race day! I’m not sure if I would have wanted to ride much further without extra padding in the shorts, but 20k was relatively comfortable. I then racked my bike (by ‘racked’ I mean I took the front wheel off and locked it up in my car) and changed my shoes before setting off for a 3k run. Although it was quite hot, the tri suit was still relatively comfortable. I’d also gone with different shoes to normal – I had an old pair of Asics which I never run in anymore but they have the advantage of being really easy to slip into. For 3k it wouldn’t matter too much that they were no good for my feet! I’d also put elastic laces in them to further speed up transition. I calculated I did the transition in about 3 minutes which I was pretty happy with. All up, from the start of the bike leg to the end of the run leg, it took me 65 minutes. So, based on that, plus maybe 10 minutes for the swim, and add on another 5 minutes, I should be able to finish the triathlon in under 1 hour 20. It didn’t really matter, but I like to have some kind of rough idea going into an event! I then had to fit in a swim somewhere. I needed to swim in the lake or the ocean – apparently chlorine is not particularly kind to the kind of fabric tri suits are made of! I decided to swim in the lake because that was where I’d have to swim on race day! Plus, there had been a shark sighting earlier that day. No sharks in the lake! Plenty of jellyfish, but no sharks! Wednesday afternoon I headed to West Lakes only to find NOT ANOTHER SOUL there! I went in anyway, and did 2 laps around the buoys which I worked out would be probably around 400m. I touched 2 jellyfish! I had new goggles as I’d had issues with my previous ones leaking. However, I wasn’t particularly keen to see what was underwater so I pretty much swam the whole thing with my head out of the water (but still swimming freestyle, sort of!) 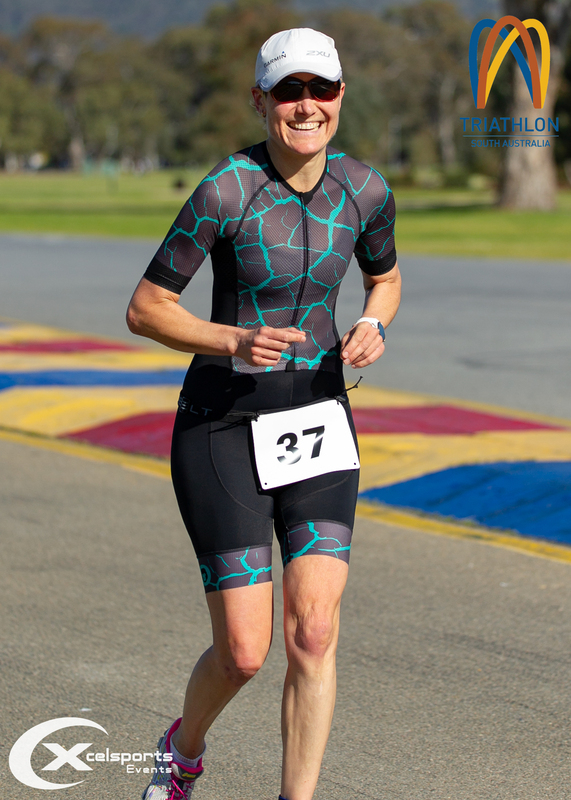 The tri suit felt quite comfortable to swim in, so I was happy that it would work for the triathlon! Thursday was a regular running day, and at post-run coffee I picked the brains of 2 experienced triathletes, Neil and Sarah, wanting to get some last-minute tips. Sarah mentioned something about not swimming in West Lakes after it had been raining, adding “do you know that rule?” Err, no, I didn’t know that rule. And it HAD been raining! Maybe that’s why there was no-one else there! On Saturday I went out to Mawson Lakes parkrun, I had no issues with the run, there was a bit of bruising on the knee but it didn’t impede my running at all. Practising my finish line race face! Then I got home and got all my kit organised for the big race – there’s quite a bit more involved in prepping for a triathlon than for a running event! Sunday morning was an early start. I got up at 5:30, leaving home at 6:15 to be at West Lakes by 7. Registration was from 6:45 to 7:45 and as a complete n00b I wanted to give myself plenty of time! After collecting my race number and yellow swim cap, I headed over to the bike compound to rack my bike. I had to try to find a spot where I would easily be able to find my bike! In the end I went with row 7 (thinking ‘lucky 7’) and as it turned out, Karen and Ros had the same idea! I’d first met Ros at the very first South Australian parkrun, way back in December 2012, and she was the person who put the idea in my head that I wanted to do a marathon one day! Ros was doing her first Tinman, but was a ‘veteran’ of a number of shorter triathlons. Her husband Roger was her support crew and ‘official’ photographer! All racked and ready! Not sure why I bothered with the drink bottles mind you. If I tried to grab one while cycling, I’d probably fall off! Running buddy and Ironman finisher Sarah, doing her first triathlon since having a baby, came over to make sure I was all sorted! The bike racks started to fill up. The sky was blue, the lake was calm. There were quite a few familiar faces there, most of them doing the Challenge (Karen, Belinda, Sarah, Luke, Rob and Matt) and also our regular running buddy Neil doing the little-known ‘Swim and Spin’ – essentially the Challenge distance tri but without the run! In the Tinman, other than Karen and Ros was Naomi who I’d met at a few running events over the years! Most people opted to get into the lake before the start of the event, to acclimatise to the water temperature. Many were wearing wetsuits. Probably not so much in the Tinman and the Mini, but certainly in the Challenge most people seemed to be in wetties. I had opted not to wear a wetty, firstly because I don’t have one, secondly because I didn’t think it would make a significant difference to my 300m swim, and thirdly because I was sure any potential gains in the swim would be lost in transition! The competitors brave the water! It wasn’t actually that bad! (And where is my right hand?) Thanks to Roger for this photo! Pretty soon we were all called out of the water for a race briefing. The director explained the course for the swim, bike and run, and I tried to take it in, but I figured I’d always have someone to follow! With fellow Tinman virgins Karen and Ros before the start! I had my Garmin all set up in Multisport mode so all I had to do was press ‘Start’ as we crossed the mat to start the swim leg. And we’re away! I possibly should have had my goggles on before this, judging by everyone around me! Thanks to Roger for the photo! Into the drink! That’s Karen in the fluoro yellow! Thanks again to Roger! Although it was really quite slow, I was really happy with how the swim went. It was essentially three-quarters of a square – straight out, around one buoy, across to another, and then straight back to shore. I didn’t get kicked, I didn’t kick anyone, and miraculously I even passed a few people! I felt very comfortable throughout. I probably could have gone faster, but as it was my first triathlon, the last thing I wanted to do was burn myself out on the swim! A lot of people had told me that they often panic in the swim and can’t get their breathing right, but I didn’t have any such issues. And I didn’t end up drinking too much of the lake so I’m counting that as a win! The hardest bit was the swim into shore, because we were looking RIGHT into the sun! Even though my gogs are very darkly tinted (a godsend in this case!) I still had trouble seeing the yellow caps in front of me! I saw people start to run while I was still swimming, and I remembered 2 pieces of advice I’d been given. First, start kicking with about 20-30m to go. Then your legs won’t be so jelly-like when you get out of the water. I don’t normally kick when I’m swimming freestyle, but apparently that’s not particularly unusual! And that goes to show what an advantage a wetsuit, with its super buoyancy, is – your legs don’t sink when you aren’t kicking! The second piece of advice was to keep swimming until your hands touch the bottom. It’s much easier to swim than run in water! My swim time was 11:23 which was 81st out of 103 competitors overall, and 29th out of 44 females. I had a bit of work to do! I made it to shore, and my legs felt OK. I pulled off my cap and goggles and made my way to transition. I had never practised the swim to bike transition, and had no idea how long it would take. I had my towel laid out so I quickly dried off, mostly my feet so I wouldn’t be putting socks on wet feet. Firstly though I put on my helmet and race number, the 2 things that were made very clear at the briefing! I got my socks and bike shoes on, and was ready to roll! T1 took me 1:47, I was relatively happy with how it went, I know a lot of more experienced triathletes have their bike shoes clipped into the pedals already and just slip into the shoes as they mount the bike, so that could possibly have saved me some time or maybe caused me to stack it right in front of all the spectators – who knows? On T1 I was 51st overall and 20th female. Bit better than my swim! Then came 3 laps, 19.5km, on the bike. On my last ride before the triathlon I’d noticed the bike was making a noise that didn’t sound right, so I’d asked Nat, from whom I’d purchased it, if she wouldn’t mind taking a look at it for me. She suggested that her son Fraser, whose bike it had been, would be better able to assess it, so I’d left it with him for a few days to take a look at. In the end it was just the bike seat was a bit loose (probably from when I’d been gradually easing the seat height up, as recommended by my cycling buddies!. When I had got the bike back on Saturday, Fraser had told me that he had adjusted the seat height so I’d need to adjust it back. As I hadn’t marked where the seat height HAD been, I had to guess a little bit. It was way too high, so I was gradually lowering it, sitting on it in my lounge room, holding onto the couch! I got it to a height that felt comfortable and I could clip in on both feet, so I guessed that would be OK. I hadn’t actually ridden it since I’d adjusted it, though. So I ran the bike to the ‘mount’ line and hopped on board. The seat height seemed OK. It took me a little while to clip in (maybe 100 or 200 metres?) but once I was in it was all plain sailing. And there was no more of that noise – the only time the bike made any noise was when I stopped pedalling, for example to go around a tight corner and especially if there were other riders coming up behind me. The ride was a surprise! I felt entirely comfortable throughout, I managed to overtake a lot of people, and going around corners was made SO much easier by being clipped in. I did use my brakes on one or two corners, but compared to when I did the duathlon in running shoes, well there was no comparison. I did not use gears. 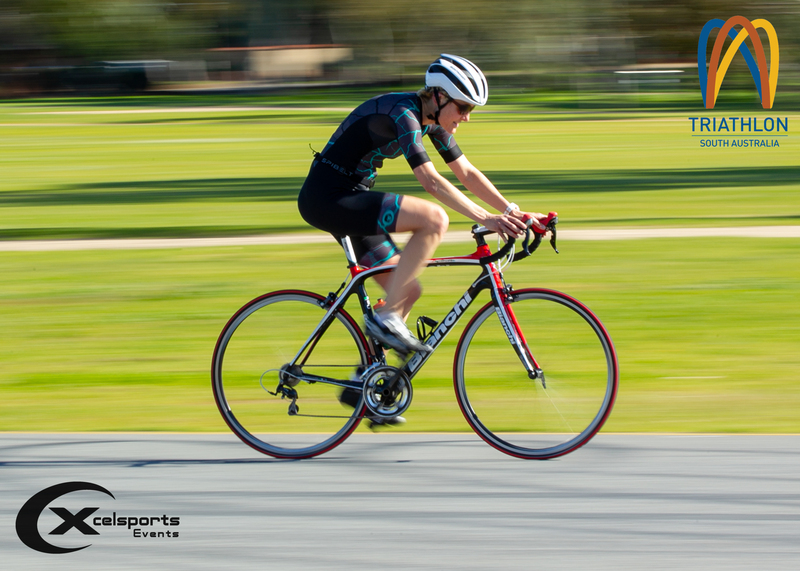 I have mastered the cleats – gears are the next lesson! I did see quite a few forlorn figures walking up the road with their bikes. Clearly they had the same ‘Plan B’ as me! With some relief that I hadn’t gotten a puncture, I completed the ride and ran back into the bike compound to rack my bike and get ready for what I always expected to be my strongest leg, the run. I had completed the bike leg in 40:57, which was actually the fastest ride (other than short sprints of course!) that I’d ever done! So that was a pleasant surprise when I found that out! I was 67th overall on the bike leg, and 19th female. T2 was pretty quick, as I’d practised that one (albeit ‘racking’ my bike in the car, which would presumably take longer than racking it on an actual rack!) – I got through it in 48 seconds but I did have a few false starts putting the bike on the rack, so I can still improve on that! I was 47th overall on T2 and 19th female. All I had to do after racking the bike was swap helmet for cap (I didn’t want to be ‘that’ person who started their run still wearing their helmet!) and bike shoes for running shoes. 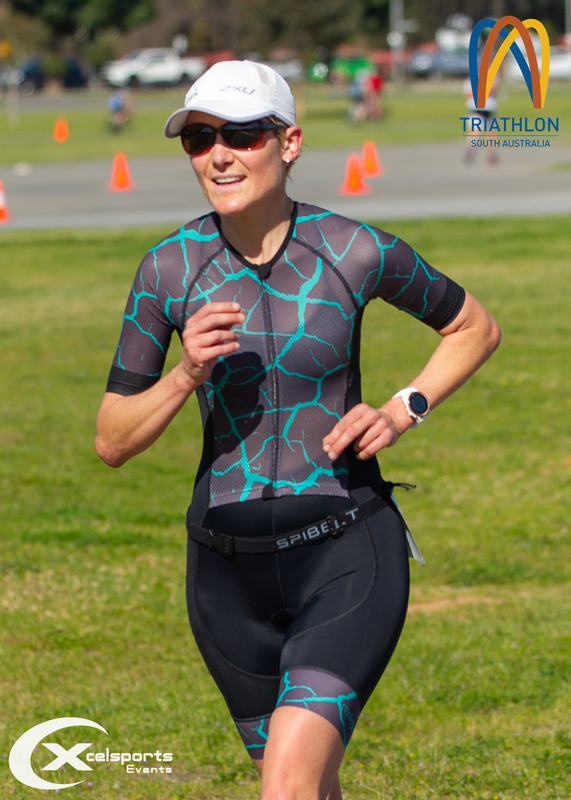 I noticed quite a few people riding in running shoes, which would have made their transitions much quicker than mine, but unlike wearing a wetsuit in the swim, I knew that wearing bike shoes on the ride would make me much quicker on the bike, and more than make up for the slightly slower transition. The elastic laces on my running shoes helped a lot! I did somehow get a rock in one of my running shoes in the process, which did not make for a particularly comfortable run, however with it being only 3k AND my best leg, I pressed on regardless. I heard occasional running buddy and very accomplished triathlete Piet praise my transition! I was pretty happy with it myself! As I pressed the ‘lap’ button on my watch for the last time, I realised that I hadn’t actually pressed ‘Start’! (Well I HAD pressed it, but obviously not hard enough!) So I went into the run with no way of knowing how far I had to go! Running off the bike is always hard. I had practised this a number of times. But it’s hard for everyone, so despite my legs feeling a bit like jelly, I still managed to pass a lot of people on the run. Because the last part of the run leg was the same route as the bike route, which I’d ridden three times, I was aware when I was getting closeish to the finish line. It certainly felt like a long 3km! And then there it was, the last turn, and I could see the finishing arch! I saw Shelley and Piet who had come down to watch (Piet has been trying to talk me into triathlon for years, and later told me he thought it wasn’t my first triathlon, he said I looked like I knew what I was doing!) and with a huge smile I ran, arms aloft, through the finishing arch! I had completed the run in 13:32 which was an average pace of 4:31 per kilometre. My 5k race the previous weekend was 4:30! So given that I’d swum and ridden before that, I had to be pretty happy! (It definitely did not feel that fast!) My run split was 18th overall and 4th out of the females. It was a great way to finish! First things first, I took off my shoes and socks – stupid rock! Then Justin, who had been down there all morning taking videos of Karen and myself to capture this epic moment, stuck a camera in my face, I gave the thumbs up, thinking he was taking a photo and then he started interviewing me! Luckily I didn’t swear! He later put together a bit of a compilation video as a memento of the day, which was really great – thanks Justin! Then we were all waiting for Karen – she hadn’t been far behind Ros in finishing the bike leg. There was an out and back section in the run leg, I’d seen Ros heading out as I was heading back, but I hadn’t seen Karen. And in her fluoro tri suit, it’s not as if I could have missed her! With no Garmin times, it wasn’t on Strava, so does that mean it didn’t happen? Here’s proof that it did! So! Triathlon! I loved every minute! This definitely won’t be my last! Things to work on for next time. Pressing ‘Start’ on my Garmin. Racking my bike a bit quicker. Maybe even some gear changes on the bike leg! So for anyone who’s thinking of trying a triathlon. You don’t need to be a great swimmer, cyclist OR runner. Piet said to me at the finish line (after asking me when I’m going to join his Tri club!) that triathlon is a very inclusive sport. Which I agreed with, then adding “AND VERY EXPENSIVE!” But you don’t have to have all the latest and greatest gear. This really is an event for everyone! Thanks to everyone involved in putting this event on, and congratulations to all participants, especially those fellow ‘triathlon virgins’! Hope you all enjoyed it as much as I did! Hang on, this can’t be right, can it? Duathlon. That’s running AND cycling. I’m a runner, not a cyclist! Well, you read it correctly. 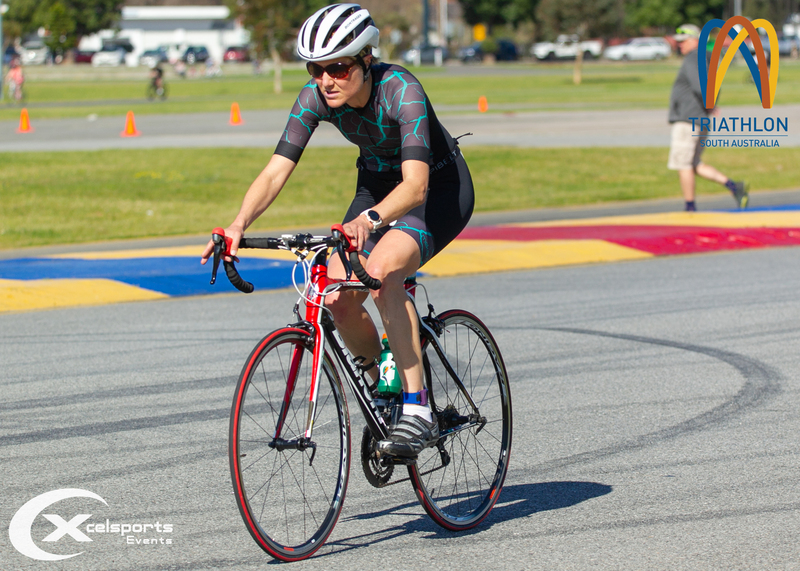 This past weekend I stepped well outside of my comfort zone and competed in my first duathlon. It all started a while ago – around 2 years ago I think, when I was doing a Heysen 105 training run with a bunch of guys from Victor Harbor – noted runner Simon, and two accomplished triathletes, Jono and Shane (Simon’s brother). They were also all parkrun Run Directors (Simon and Shane were also the Event Directors and the people you have to thank for bringing parkrun to Victor!) so we had plenty to chat about. I remember asking Shane if he was going to run the Heysen 105 but being so close to a fairly important triathlon event (Murray Man), that was not going to happen. Not that year, anyway! A little further down the road my friend and regular running buddy Nat offered to give me a few lessons on the bike. I didn’t have a bike at that stage, and I had NEVER ridden a road bike, or with cleats! (Like most kids, I had had a bike, but since being an adult, my cycling experience was pretty limited. I had done an easy cycling tour in Berlin, a ride across the Golden Gate Bridge in San Francisco, a ride through Stanley Park in Vancouver, and most recently rode around Inis Mor off the coast of Ireland (near Galway). This was during the summer of 2015-2016. Sometime during 2016 there was some banter between Shane and me regarding him doing the Heysen 105 and me doing a triathlon. I guess theoretically you could say I had the easier part of the deal – a mini triathlon is still a triathlon, but he still had to run 105km! I kept using the fact that I didn’t have a bike as an excuse, he would send me invites to all these triathlon events but somehow I always managed to have a running event on (or some other excuse!). Plus, 2016 (at least the first part of it) was consumed with my trying to qualify for Boston! Then, in October 2016, it happened. 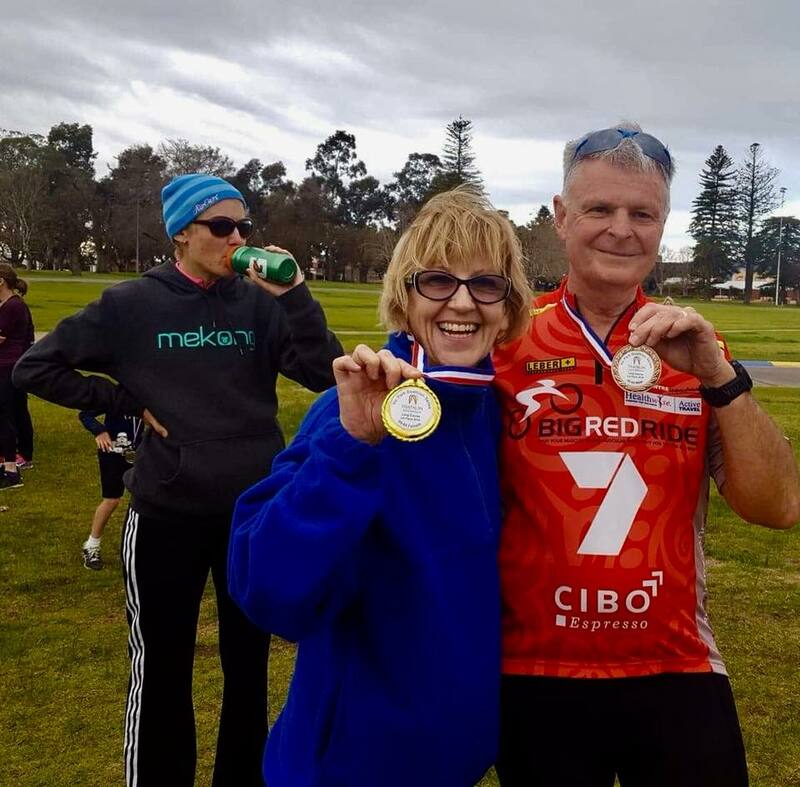 Shane became an ultramarathoner by completing the Heysen 105. (Hey, if you’re going to do one ultra in your life, it might as well be a 100k!) I thought to myself, I guess I’m really going to have to keep up my end of the deal now! Then things went relatively quiet. 2016 came to an end, then my Boston training began, and any thoughts of doing one of the summer triathlons went out the window. And then, in early July, I got the message from Nat that I’d been kind of hanging out for. I WAS planning to buy a bike, but I always had in the back of my mind that the Bianchi might become available any time, and it was going to be vastly superior than any other bike (new or secondhand) that I could afford to buy. Her son was about to turn 15 and he was getting a new bike for his birthday. Did I want to buy the Bianchi? You bet, I said (or words to that effect). So then, for about 6 weeks, it sat in my bedroom, bemusing my cats, and generally gathering dust. In my defence, the winter weather was pretty crappy for riding and I didn’t really want to start riding in adverse conditions. Around 3 weeks ago I went to yet another parkrun launch down at Aldinga, Simon and Shane were also there along with a few other members of their family! Shane mentioned a duathlon coming up at Victoria Park in a few weeks, he was entering his son in the ‘Enticer’ distance and he was doing the long course (also the State Championship race). I thought, yeah, I can probably do that! I SHOULD do that! It’s not a triathlon but it’s a start! My first ride was up and down a newly resurfaced back street near where I live. The U-turns were a bit tight, but I wasn’t quite ready to tackle proper roads (plus I still haven’t mastered the art of signalling!) I managed 5k quite comfortably and decided to enter the duathlon. It was a 2.5km run/9km ride/1.25km run, all on bitumen, and dead flat. I could definitely do that! So I entered, but I didn’t want to tell too many people. I didn’t want witnesses! In my favour was the fact that the duathlon clashed with the final Yurrebilla training run, and many of my running friends would be there, safely clear of Victoria Park! I told Shane of course – he would be there anyway, and it was pretty much his fault I was doing it anyway! Fast forward to race weekend. I thought I’d better get out and do another ride so on Saturday afternoon I ventured a bit further afield (this time I was at least in ‘activewear’, having done a run earlier) and rode laps around the block, including 2 main roads (one with a bike lane, one without). I attempted left signals but I don’t think they were that great. At least at that time of day there was not a lot of traffic! I only did left turns! (Signalling was not going to be an issue in the race so I can work on that later!) I rode just under 9km which was the distance I’d have to ride on Sunday. Gear-wise I didn’t have a trisuit but I did have some shorts which I think might be tri shorts versus normal bike shorts (I have a pair of bike shorts that are extremely padded, and these ones have padding but not quite so much. I got them from an op shop, still with the tags attached! Winning!) and I just went with a plain black tank on top. Thought I might keep it low key. Then I couldn’t help myself so I added rainbow arm warmers! On Saturday night while I was getting my gear ready (and entering new territory in setting my watch to multisport mode!) I was chatting with Shane on Messenger and he sent me a few funny videos (mostly what NOT to do in transition) and also gave me one piece of advice which I took very seriously since it was all in caps! How bad would it be if I forgot my helmet? Or my bike? I had the helmet and the bike ready in the lounge the night before so I couldn’t forget either! In the morning I got ready as usual and then went to put the bike in the car. Now bear in mind I’ve ridden it twice. I certainly haven’t taken any bits off it! Well the plan was to fold the back seats down and put it in in one piece. But one of the seats wouldn’t fold down so the only way I could get it in was to take off the front wheel. It was a bit of a tight squeeze but there was no way I was taking off the back wheel too! I got to Victoria Park way early, and was just sitting in the car thinking I might listen to a few more tunes before getting out, when a car pulled up just near me, it was Shane, Simon and Shane’s son Finn who was doing the Enticer with me. Luckily I had professionals to help me reattach my front wheel! It looked so easy! I didn’t have any pockets in what I was wearing, so I shoved my coffee money down one side of my shorts, my car keys in the other, and my energy drink down the front of my shorts as we rode around the track to the registration area. First stop was the transition area to rack my bike. The guy there was very helpful, he even helped me adjust my helmet straps. He and Shane showed me how to get the bike off the rack and also how to put it back on when I’d finished the bike leg. The helmet was placed under the bike and I went to collect my bib and a few extra pins to pin my car key and my coffee money inside my shorts! We went for a little warmup ‘jog’ and then it was time for the race briefing. I must say I was probably more confused after the briefing than before! The Enticer and the Sprint (long) distance both started at the same time. It would be up to us to count our own laps. We had a 2 lap run, a 4 lap ride and a 1 lap run. The Sprint distance was double that. I was glad that the highest number I had to count up to was 4! We started with a run, I was pretty comfortable with that! I’d done 2 races here before – the Clipsal Hot Lap Fun Run which followed the Clipsal 500 (motor racing) track and the SARRC loop event, both last year. It’s a good, flat, fast course! Our run was only 2km so that was pretty much a walk in the park for me! I was possibly one of the first (well I was definitely one of the first 7!) to enter transition for the first time. Helmet ON. Helmet DONE UP. Bike unracked. Walked through transition to the section where we could mount the bike. Most people would run here. Not me! On my first lap, I didn’t have to contend with other riders coming back the other way, as all the Sprint competitors were still running. By my second lap, I’d be being overtaken left, right and centre (well maybe not so much centre!) by the fast cyclists! While I was messing around with my helmet (I’d stupidly left it buckled up, so I had to unbuckle it first – definite rookie mistake – and then managed to pinch myself with the buckle on the first attempt) Finn came into transition, his bike being right next to mine. We got onto the bikes and we had pretty much the whole track to ourselves, well for a short time at least! Another one of the Enticer guys, who wasn’t there when I was in transition, flew past us. At least now I had someone to follow! Towards the end of the lap there was a U-turn which I totally missed – I ended up going a bit too far but still managed to turn safely without causing a pile-up (my biggest fear in the bike leg!) – then as I was going back the other way I saw Finn turning at the proper place. And I didn’t make that mistake again – after missing it the first time, I could see it was actually very well marked. It was just because I didn’t have anyone close in front of me at the time, and I tend to rely on following people – definitely not used to being at the front! Didn’t fall off. Didn’t cause any pileups. I’m calling that a win! There was one of the Enticer guys just in front of me on the run but I was pretty confident I’d catch him, and I did, without too much trouble. I wasn’t sure who the other Enticer people were – as it turned out a few of them had probably already finished! I got over the heavy legs pretty quickly and managed a decent pace for my last run. The guy who I’d passed wasn’t too far behind me, and Finn a few minutes back from him. Legs like lead – but got it done! Thankfully just the one lap! Although I was happy to keep it low key for my first event, it was nice to have some support from the crowd in the form of Ian and Julie, Simon and Shane’s parents who had made the trip up from Victor to watch their sons and grandson compete! This was a bit after I’d actually finished, hence the reason why I’m standing still! I stuffed up the Garmin a bit on the transitions, it seemed to think my last leg was on the bike (which would have been INCREDIBLY slow!) but thankfully I managed to correct it on Strava! After finishing and getting the all-important post-run coffee, I watched the Sprint athletes finish off their ride. It must have been hard for them to count laps – Shane wasn’t sure what lap he was on as he passed us the last time, but he guessed by the distance on his Garmin that he had to be on his last lap! In the end, Simon paced his run perfectly and passed Shane just before the finish, beating him home by 4 seconds! After that came the presentations and I was pleased to win my age group and get a shiny medal – I wasn’t expecting to come away with bling, an added bonus! A hotly contested age group win. Well, an age group win anyway. I’ll take it! All in all it was a fantastic introduction to transitions, running off the bike and the other new experiences that come with the multisport world! I LOVED it! The weather was perfect, the other competitors were great (I managed not to get in anyone’s way, and the riders were all really good at calling out when they were about to pass me) and the volunteers as always were fantastic! 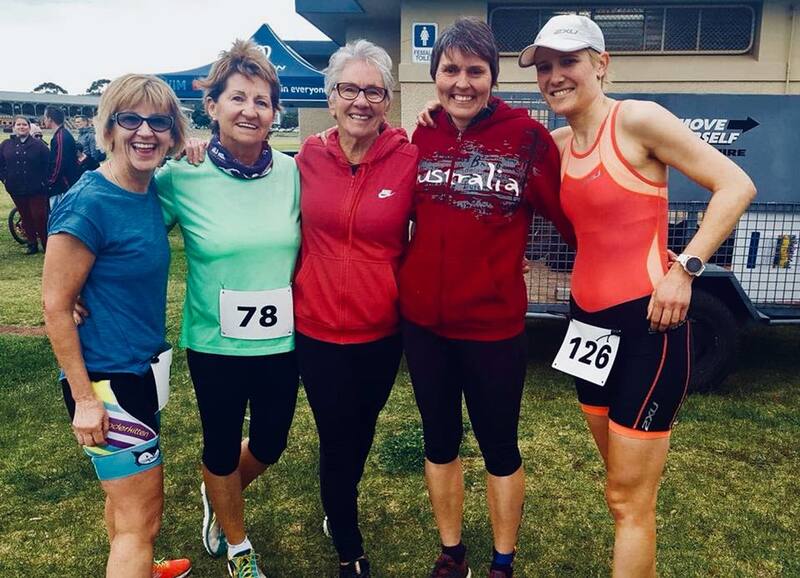 I’m definitely keen to do another duathlon soon – maybe I’ll go and play with the big kids next time! Special thanks to Shane for talking me into it in the first place and for all the advice! Oh and I know I haven’t quite held up my end of the deal yet but at least now I’m 2/3 of the way there!